Background: Prehospital delays in receiving emergency care for suspected stroke and myocardial infarction (MI) patients have significant impacts on health outcomes. Use of Emergency Medical Services (EMS) has been shown to reduce these delays. However, disparities in EMS transport delays are thought to exist. 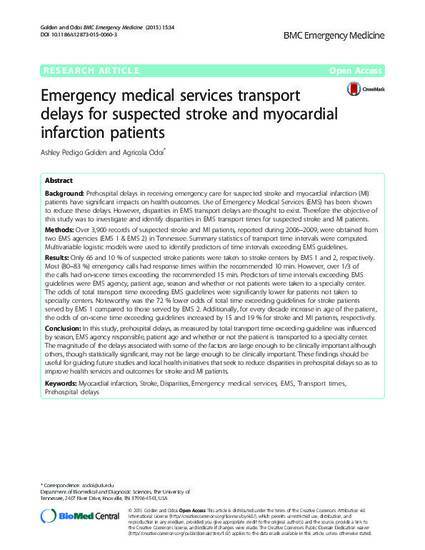 Therefore the objective of this study was to investigate and identify disparities in EMS transport times for suspected stroke and MI patients. Methods: Over 3,900 records of suspected stroke and MI patients, reported during 2006–2009, were obtained from two EMS agencies (EMS 1 & EMS 2) in Tennessee. Summary statistics of transport time intervals were computed. Multivariable logistic models were used to identify predictors of time intervals exceeding EMS guidelines. Results: Only 66 and 10 % of suspected stroke patients were taken to stroke centers by EMS 1 and 2, respectively. Most (80–83 %) emergency calls had response times within the recommended 10 min. However, over 1/3 of the calls had on-scene times exceeding the recommended 15 min. Predictors of time intervals exceeding EMS guidelines were EMS agency, patient age, season and whether or not patients were taken to a specialty center. The odds of total transport time exceeding EMS guidelines were significantly lower for patients not taken to specialty centers. Noteworthy was the 72 % lower odds of total time exceeding guidelines for stroke patients served by EMS 1 compared to those served by EMS 2. Additionally, for every decade increase in age of the patient, the odds of on-scene time exceeding guidelines increased by 15 and 19 % for stroke and MI patients, respectively. Conclusion: In this study, prehospital delays, as measured by total transport time exceeding guideline was influenced by season, EMS agency responsible, patient age and whether or not the patient is transported to a specialty center. The magnitude of the delays associated with some of the factors are large enough to be clinically important although others, though statistically significant, may not be large enough to be clinically important. These findings should be useful for guiding future studies and local health initiatives that seek to reduce disparities in prehospital delays so as to improve health services and outcomes for stroke and MI patients.